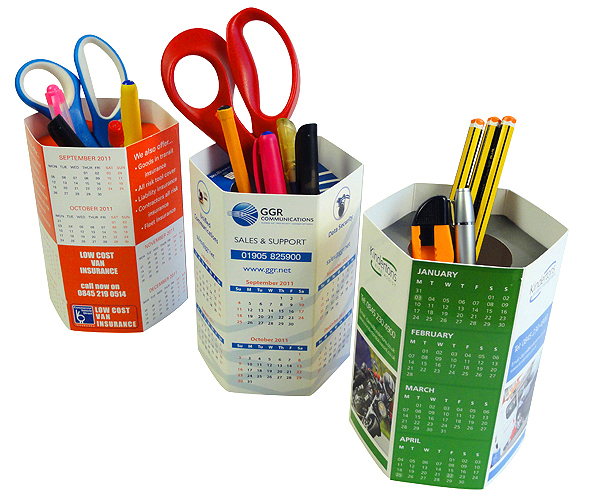 Our customized desk calendar products are an impressive promotional idea that your customers will enjoy and appreciate. 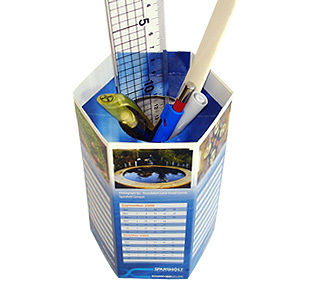 Like all our pop up mailers the Power Pen Pal customized desk calendars arrive in mailers made specifically for them, and will surprise your customer as they spring to life taking 3D shape when opened. After successfully capturing the attention of the person who opened it (along with anyone who happens to be near them) the Power Pen Pal customized desk calendar immediately becomes a useful desk top accessory. These customized desk calendars from Pop Up Mailers will continue to put market your business to business promotion for a long time. First and foremost the Power Pen Pal has earned a terrific reputation as a desk-top pen holder but is becoming an increasing popular choice as a customized desk calendar too. Power Pen Pals make unusual and vibrant business marketing products and company promotional products as these customized desk calendars are full of fun and energy and always warmly received at any time of year. The customized desk calendars are always popular at Christmas for business direct mail campaigns but realistically you could send pop up mailer calendars at any time of the year. Maybe your product or service is related to the financial industry, and so it might be more useful to you to send your customized desk calendar around April time in line with the beginning of the tax year. Or if you do business with schools and higher education you might choose to send your pop up mailer desk calendars in September to coincide with the start of term. Perhaps your business is based around leisure and tourism and sending in the summer would make more sense for you - you can send your customized desk calendar whenever it suits you. For your next business to business marketing campaign why not design a Power Pen Pal as a customized desk calendar, great corporate direct mail ideas for business promotions? Part of the fun with the customized desk calendar pop up mailer products is that when your customers receive them, the product bounces out of their custome mailer and takes them by surprise. Pop up mailers are lively business promotional products that will work hard for you, including these customized desk calendars which have attitude and style. The Power Pen Pal has six sides which makes it the perfect platform for printing two calendar months per side.